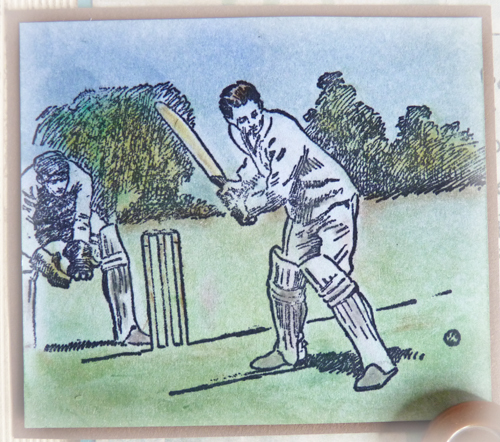 A vintage birthday card on the theme of sports today and using the only sports related stamp I have got!! 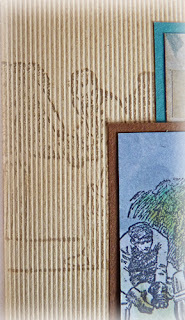 The textured card was stamped with the image in embossing ink and PanPastels rubbed over the top to give the ghost image in the background. 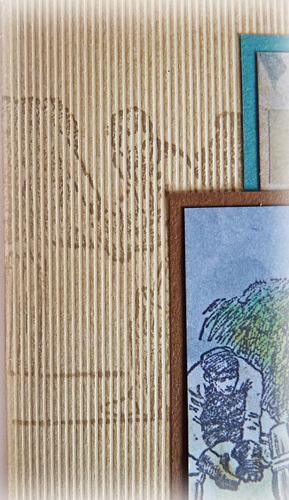 I used several masks and layered embossing inks and PanPastels for the backing panel. For the focal image I blended blue and green PanPastels on the card and then stamped with archival ink. Using the Sofft blending tools and a rubber I 'painted' the main image. Now I see it photographed, I realise I should have tried some of my team mate Claire's clouds on it. Mmmm must remember that next time. Some simple embellishments, keeping it quite plain for a masculine card, finished it off. To enter the PanPastel UK challenge - just pop over to their blog to see the details for entry and the fabulous inspiration from the design team. The lucky winner will receive a special trial pack of Pan colours and tools from Your Creativity Store. Have fun with your crafting. a beautiful sporty card! wonderful colors! Love the card Brenda,Paul & Sam are both cricket mad and would love this card, Sam plays for a local team but has yet to get to play because of the weather, even despite the sun today, the match has been cancelled because the ground is to wet.He's not a happy chap. See you on Wednesday, looking forward to it. Hi Brenda...lol, boy, does this remind me of some great pommie V aussie cricket matches! Great card with some great textures! Lovely card, Brenda, perfect for a bloke!...those pastels are brilliant, must get some. I have linked up to your 'Inspiration' challenge. It is a longish post....feel free to delete it if it's not quite what you expected. Great masculine card Brenda! Love the textured faded image in the background too! This is absolutely wonderful. I will check out the challenge. Thanks for visiting today. This card is great!!! I love baseball - we used to go to games as a family all the time. My brother played little league and now his kids are playing. So many wonderful memories. Hi Brenda thank you for your lovely comments on my cards. Your card is fabulous, what fantastic work, well done . 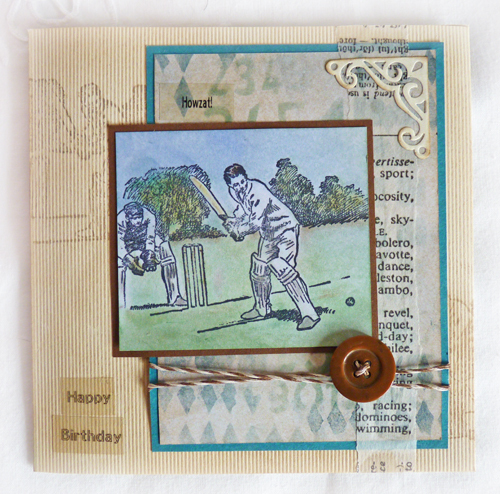 I love the vintage feel of this one great for a friend of mine who is cricket mad. Just catching up here Brenda and you've made some really gorgeous creations. Love them all especially the royal tag - the background is fabulous! The craft show I went to was at the Brighton Centre not Port Sunlight (I wish!!!) but I still managed to spend some dosh especially on the Art of Craft stand! this is fantastic ! Love the colours bought a load of PPS while I was in the UK. The stamping is amazing as is this super design. Love the soft image by stamping on cardboard! Brillant idea!